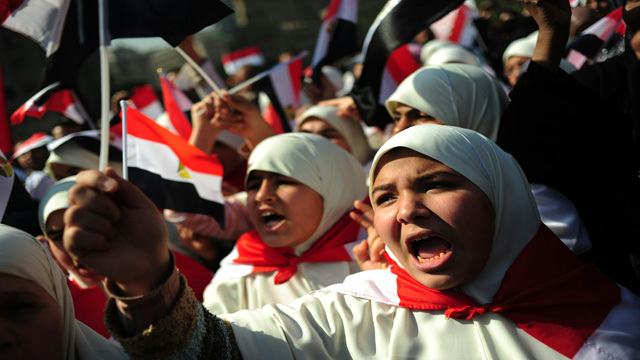 Cairo, Egypt (CNN) -- Several hundred people showed up for a pro-women demonstration in a major Cairo square on Tuesday -- including some men who chanted anti-feminist slogans. Egyptian activists had called for a Million Woman March on Tuesday, demanding "fair and equal opportunity for all Egyptian citizens -- beyond gender, religion or class." "Men are men and women are women and that will never change and go home, that's where you belong," some of the anti-feminist demonstrators chanted. Organizers calling for the demonstration said on Facebook they were "not after minority rights. We are not after symbolic political representation." Activists highlighted the role of women in the protests that swept Egypt this year. "The bodies of women, so often used as ideological battlegrounds, have withstood all kinds of police violence, from tear gas to live bullets. The real battleground did not differentiate between women and men," they said on Facebook. Women were very visible among demonstrators who toppled Egypt's President Hosni Mubarak last month, which feminists called a breakthrough for Egyptian society. "The barrier of patriarchal control is one that Egyptians have managed to break since day one of the revolution," march organizers said in calling for the demonstration on Tuesday, which is International Women's Day. "For a long time, (patriarchy) had stifled Egyptian society as a whole and was felt most acutely by women," they said. But since protests took off in late January, "Egyptian women have resisted unjust control and fought to bring down the patriarchal regime and liberate themselves and their country," they said. "What Egyptian women have done and continue to do in this revolution is not new to them," they argued. "It is a continuation of the role they have always played throughout history for the advancement of their country and its liberation from various forms of tyranny. Women's roles shall not be ignored nor their sacrifices forgotten," they insisted. The march started in Tahrir Square, the focal point of anti-Mubarak demonstrations, on Tuesday afternoon. A survey in 2008 by the Egyptian Center for Women's Rights claimed that 98% of foreign women and 83% of Egyptian women in the country had been sexually harassed. CBS reporter Lara Logan was attacked in Tahrir Square after Mubarak stepped down, and other women reported incidents ranging from mild harassment to violent attacks. Five years ago, the Egyptian Center for Women's Rights closed its program helping young women get involved in local politics because of lack of interest. Today, the organization says it is inundated with young women wanting to get involved in its campaigns.